Try some local flavor at a farmers’ market in the Laurel Highlands. These markets pop up across the region each May and continue weekly until the end of October. 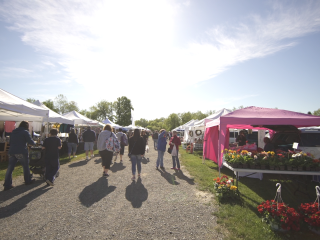 Enjoy farm fresh produce, prepared foods, homemade goodies, handmade crafts, and more from local producers and crafters. Go early to get the best selection of produce. Bring CASH, change, and small bills, to make shopping fast and easy! Ask the farmers for recipe tips and best ways to prepare different foods. Don't forget a cooler to keep your perishables fresh until you get home. Plan to eat lunch there! Many stands make terrific prepared foods. Bring reusable shopping bags to carry all your goodies!